Off the Beaten Path: Up In Front...Oh My! Today I'm re-posting one of my favorite information/education kind of posts. When someone pinned this post to their Pinterest board recently, it caused me to go back and read it again. Pretty good stuff. If you have any reason at all to get in front of a microphone or behind a podium in the near future, you may find this post especially helpful. Here's to rooting you on! What about you? Are any of those your top fears? I'll admit to being afraid of snakes. But fortunately I'm able to avoid those most of the time. Still, you better believe my eyes are always peeled for snakes as I navigate our nearby hiking trails. On the other hand, I've made a life of speaking in public. Other than the occasional kaleidoscope of butterflies--caused more by excitement than nerves--I have no qualms with speaking before a large crowd. I started out afraid of talking to anyone, much more so a group of any number. I'd get clammy palms, my heart would race, and sometimes I even plain out refused to step up to the platform. You see, another interesting bit of Gallup poll trivia is that while 52% of those with a high school diploma or less education fear standing in front of crowds and speaking, only 24% of college graduates fear the same thing. That indicates to me that education, practice, and more practice help alleviate this particular fear. I recalled recently that as an elementary school child my mother insisted I join the 4-H Club. I didn't raise cows or chickens or pigs. I didn't grow vegetables or can peaches either. I spoke. And I didn't just speak; but I entered speaking contests, all at my mother's prodding and insistence. For instance, I remember creating a box full of babysitting helps -- a touch and feel book, a book on tape, and a game -- as one of my 4-H projects. But then my mom insisted that I present the project to my 4-H Club, then a panel of judges, then another panel of judges, and still another, until I'd made it to the state competition level. For all I know she probably had me present my spiel about my babysitting box to a group of her friends before they all played a round of Rook on a Friday night as a way of practicing my speech. But in the end, I knew how to tell people about my creation, how it worked, how it would benefit the keen babysitter back in the 1970s before kids were more interested in electronics than books on tape. Yep, I could talk my way out of a paper box alright. Of course since then I've continued my training in public speaking. I took a speech class in college, received training from CLASS speakers' services, and read up on effective speaking. But it all started with things like 4-H, Girl Scouts, and Girls in Action back in the day. I'm not an expert on overcoming phobias, so if you are one of the 44% of women who are fearful of speaking to a group of your peers I can't offer a cure-all. But I can give you a few of the most tried and true public speaking tips that have worked for me over the years. These aren't so much message development tools, mind you, but just basic tips for overcoming the fear of being in the public-speaking spotlight. Know your stuff. Actually, know even more stuff. I find that it works best for me to know more about the subject than I'll even get to share with my audience. A wealth of knowledge makes me a richer and more confident speaker. It also prepares me to answer questions afterward. Be prepared...and more prepared. Even today I go over my messages verbally--standing at my kitchen table and talking to an audience of two disinterested dogs--at least four to eight times before I ever present them to real, live, breathing, thinking people. And I've found there is a direct and stark correlation between the number of times I rehearse and the success of my actual presentation. Get the timing down. Some people think they're not going to have enough to say and end up saying way too much. Others think they've planned for an hour and end up giving their audience a 10 minute teaser. Once again, rehearsing is the best cure for either extreme. But I've found I speak faster to my people audience than I do my dogs, so I always allow for the difference. Put the clothes back on your audience. You've heard people--usually on television shows--say "Envision your audience all in their underwear and you won't be as nervous." Well, people in their underwear would make me squirm with discomfort. So instead give your audience a little more dignity than that. Envision them as an intelligent, curious, and deeply interested crew. Don't convince yourself they're mocking you or bored with you. That's rarely the case, especially if you've followed my first three tips. Pray and breathe right before. I always take a few moments to ask God to help me speak so that I am understood. I don't ask Him to make me amazing to my audience, but just get the message across despite any errors I may make. That kind of prayer keeps my ego from tripping me up before I even take the stage. I also try to get my breathing under control before I approach the platform, otherwise I find myself operating breathless throughout my speech, causing my words to sound choppy. Just consciously breathe in and out, nice and deep and slow, before your name is announced. Know where you're going and go. I find that the less I need to refer to my notes, the better. Instead I try to map out my message like a walk down the street. I imagine I'm walking someone from point A to point B and telling them about the things we're passing on the way. That means I need to have "walked this proverbial path" so many times beforehand that I couldn't possibly get lost, even if I encountered a "storm" on the way. When I walk my audience through my message rather than present it to them from my notes, I give a more engaging message and I find it easier on me as well. Practice. Not just in front of your dogs, however. Practice by speaking to real groups of real human beings. The more you speak in front of others, the better you will get at it. More than likely you will need to present a message to a crowd of your peers sometime this next year, whether it's a Sunday school lesson, a committee report, or a MOPS devotional. I hope these tips help you deliver like a pro. 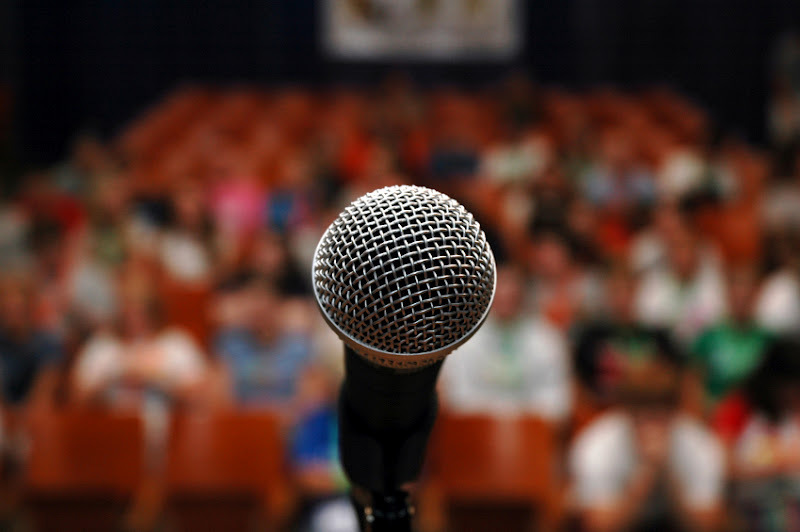 Do you have any tips for overcoming the fear of public speaking? What has helped you deliver a message in front of a group of your peers?